HONG KONG, CHINA--(Marketwired - May 4, 2017) - Uni-Bio Science Group Limited ("Uni-Bio Science" or the "Group") (HKSE: 690) today announced that, with the exclusive global rights to manufacture and commercialize Mitiglinide acquired from Jiangsu Hansoh Pharmaceutical Co. Ltd ("Hansoh") in 2015, it is launching this new oral anti-diabetic drug (OAD) under the registered brand name (Bokangtai) today in Fujian province, subsequent to the drug being included in the 2017 NRDL. The new oral anti-diabetic agent belongs to the glinides class of blood glucose lowering compounds. It is known to improve postprandial hyperglycemia (after meal blood glucose spike) in patients with Type 2 diabetes and has received New Drug Approval from the China Food and Drug Administration as a first and/or second line of treatment for the disease. Mitiglinide has demonstrated strong clinical advantages against other glinides. It acts fast after intake, lowering blood sugar within five minutes compared with other treatments in the same class which can take up to 15 minutes and has lower risks of hypoglycaemia and dyslipidaemia. Before the end of 2016, the Group's tendering task force began related activity for Bokangtai in several provinces. Following the sales and marketing teams' efforts, Bokangtai was finally launched and shipped to a number of hospitals in Fujian province in April 2017. The Group has also submitted tenders for Bokangtai in Shanghai, Chongqing, Guangdong and Sichuan with a target to sell Bokangtai in at least 10 provinces by the end 2017. Type 2 diabetes patients in China typically see their blood glucose level spike after meal, mainly an indication of beta-cell dysfunction. Early insulin secretory disorder or dysfunction are prevalent among Asian diabetes patients. Among oral diabetes drugs, glinide class drug mechanism acts on pancreatic beta-cell to counter its pathophysiological defect, thus can help improve postprandial hyperglycemia. China has the largest diabetic population in the world, over 100 million currently (approximately 8% of the population)i. The diabetes drug market in China has had stable double-digit growth over the years, with annual sales reaching approximately RMB220 billion in 2016. The Mitiglinide market has been growing consistently at above 40% CAGR since 2014. As an insulin secretion stimulating agent, glinide class drugs (and Mitiglinide) are commonly used in combination therapies together with insulin and other oral anti-diabetes drugs in other mature markets. 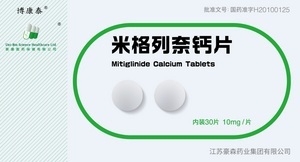 For example, Mitiglinde is already the best selling Glinide product in Japan with well over RMB1 billion of sales. Considering that China's diabetes population is approximately 10 times that of Japan, the launch of Bokangtai will meet the massive potential demand of the diabetes drug market and it will become a strong revenue driver of the Group. Mr. Kingsley LEUNG, Chairman and Executive Director of Uni-Bio Science, said, "We are happy to announce the launch of Bokangtai, which has been proven safe and effective for treating Type 2 diabetes and potentially warrants the 'best-in-class' glinide title -- a new milestone for us in just a year and a half after we acquired the drug. As diabetes management in China advances employing more of combination therapy, Bokangtai which has recently been included in the 2017 NRDL, will be a welcomed addition to the therapeutic regime. Hence, we expect it to become a strong growth driver of the Group. More importantly, encouraged by the successful launch of Bokangtai, we have stepped up preparation for the commercial launch of our propriety product Uni-E4, which has completed phase III studies and is in final preparation for securing pre-approval and commercialization. Going forward, we will continue to strengthen our position as an expert in diabetes management and push harder still in identifying new treatment options for Type-2 diabetes patients in China." Uni-Bio Science Group Limited is principally engaged in the research and development, manufacture and distribution of pharmaceutical products. The research and development center located in Dongguan, PRC is fully equipped with a complete system for the development of genetically-engineered products with a pilot plant test base which is in line with CFDA requirements. The Group also has two GMP manufacturing bases in Beijing and Shenzhen. The Group is focused on the development of novel treatments addressing the therapeutic areas of diabetes, ophthalmology and dermatology.